Which of these lies have you been told? Let’s face the truth. People lie on a daily basis. Probably, somewhere in the world right now, someone is telling a lie. But why do we do it? Why are we virtually incapable of practicing 100% unadulterated honesty? Well, it can be difficult to generalize. People lie for completely different reasons every day. Some people tell lies to protect other people from the harsh realities of the truth. Other people lie as a means to get themselves out of trouble. A few people lie just for the sake of causing destruction and creating confusion. Whatever the case, it’s almost for certain that people absolutely hate being lied to. When it comes to dating, we always demand complete honesty from the people we’re with. We don’t want to ever be blindsided when it comes to love and romance. That’s why we always want to make sure that we’re seeing the whole picture; that we’re not kept in the dark about anything. However, it’s important for you to know that people constantly lie to each other even in relationships. Especially in the early parts of a relationship wherein a person just wants to come off as something close to perfect, it can become very easy to lie. So when you’re going out for someone for the first time, it would be safe to assume that that person won’t be completely honest with you right away. 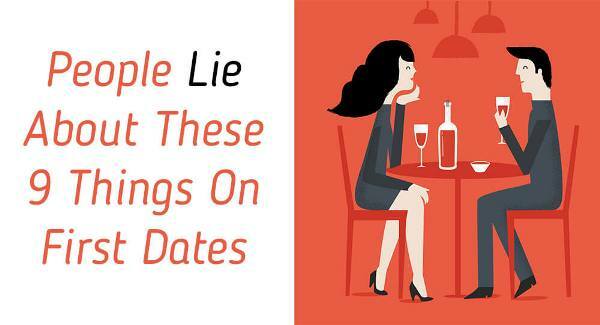 Here are the most common things people lie about on the first date. Obviously, sexual experience wouldn’t be a comfortable topic for one to bring up during a first date. That’s why whenever the conversation manages to hover around this area, people will tend to distort the truth the best way that they can. This isn’t a usual first-date-conversation material, and so it’s perfectly reasonable for people to lie about their sexual experiences. This is a sensitive area and not many people are comfortable with talking about it. This is another sensitive area of conversation, but it isn’t necessarily as taboo as sexual history. Here’s a tip, when you’re on a first date with someone, it wouldn’t be good to bring up relationship histories at all. They have their place in history and they should be kept there only to be revealed at a more appropriate time. In an effort to impress the other person on a first date, people might try exaggerating just how well they are doing on a financial level. They will try to impress the other person with a fancy job title and ballpark figure of how much they earn. Another scenario of financial dishonesty is when a person will be overly modest about how much they earn so as not to make the other person feel inferior or intimidated. Plenty of reasons as to why a person might want to lie about the place of residence on the first date. First, maybe you’re a little creepy and that person doesn’t want you to know where he/she sleeps at night. Or second, maybe that person is ashamed of the neighborhood that they live in and would prefer that you not know about that part of his/her life. This is a very tricky situation. A lot of people will lie about their age especially if they know that the people they are dating will be intimidated by what their real age is. However, the truth eventually does come out so you have to be wary of these lies. In an effort to impress the other person, one might have to lie about hobbies and interests. For example, to win over a smart and intellectual girl, a guy might start saying that he likes to read a lot, and that he enjoys engaging in deep intellectual conversations with people. This doesn’t have to be true. The girl just has to believe it to be true. A lot of people will not want to reveal their jobs on the first date. This could be due to two possible reasons. One, that person is engaged in some shady business like drug peddling or fraud. Or two, that person is ashamed of living in a lowly career that doesn’t earn that much money. Children can be a game changer when it comes to dating. A lot of people are intimidated by dating people who already have kids. That’s why a lot of people might resort to lying about the existence of their children on the first date so as not to scare the other person off. However, this is another lie that no one is capable of concealing forever. Particularly for people who have gone through divorces. There is a stigma attached to people who are divorced and they know it. That is why whenever they choose to start diving into the dating pool again, they might conceal the fact that they had already been previously married.